» home » enterprise zones » » you can stamp it...but can you move it? Permanent-magnetic chip and part conveyors handle many sizes of ferrous materials, including small parts, stampings, scraps or chips. A lack of any moving external parts prevents jams and helps minimize risk of operator injury. Standard conveyors offer an angled incline as great as 90 deg., as well as large, sweeping radii to elevate long, difficult-to-handle scrap or parts. conveying and feeding equipment more readily enjoy productivity and profits rather than backlog and breakdown. Why? Because efficient and reliable transport of parts and scrap allows manufacturers to get the most from their high-productivity equipment, and maximize earning potential. Jams or slow-downs in conveyor systems easily offset machine-tool productivity, while a reliable conveyor system employing the right balance of equipment supports smooth, uninterrupted production flow. As with most investments, cost plays a critical role in selecting a conveyor system. However, when considering equipment cost, initial investment comprises only one aspect worth examining—other aspects to consider include operating expense and maintenance requirements. And another important factor, often overlooked: cost/performance ratio per dollar of investment. Balancing all of these variables allows for the design and build of a part- and scrap-handling system that will optimize productivity at a cost that is quickly recovered. While many conveyor systems incorporate standard off-the-shelf components, the ultimate design of each is dictated by the unique application requirements. Accommodation must be made for the nature of the conveyed product, available floor space, type and performance of the production machines and, often, ambient temperatures or other special conditions. Generally, to convey large parts or scrap—ferrous and nonferrous—vibratory (oscillating) or belt conveyors get the call, while magnetic chip and part conveyors find preference for conveying smaller ferrous products and chips. Permanent-magnet belt conveyors handle all sizes of ferrous material, from small to large stamped parts or scrap. The first issue to contemplate is the material being handled. While steel-, cloth- or rubber-belt conveyors can handle practically any stamped product, sharp edges on the conveyed product material can cut a cloth or rubber belt. Hinged-belt conveyors provide efficient long-run handling of ferrous and nonferrous parts, press scrap, chips and turnings—hot or cold, wet or dry. These conveyors can combine horizontal and elevating movements to convey a range of products, from nested material to stampings, in large volumes. Maintenance costs, however, can be somewhat higher than for other conveyor types. And, small parts or scrap can jam in pinch points or work their under the belt, causing jams or premature wear, and possible downtime. Oscillating and vibratory conveyors, which use sturdy pans or trays to convey material, often find use under presses or machine tools to bring products or scrap out to a less-rigid conveyance module. The pans or trays are not likely to be damaged by sharp edges on the parts or scrap; metalformers can select among different tray types designed to handle a variety of finished parts or scrap in sizes that range from small stampings or chips to large skeletons; and, these units lack any hinges in which material can become trapped. Yet, vibratory conveyors require more floor space than do belt conveyors, and can only move materials at a 3- to 5-deg. incline or a 0- to 15-deg. decline. 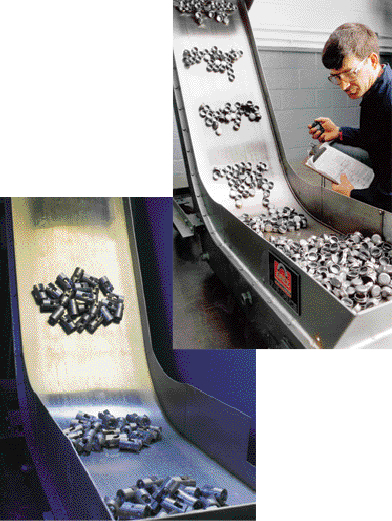 Magnetic conveyors offer an efficient and dependable method for handling ferrous materials. These units convey chips, nails, stampings, cans, small machined parts and related ferrous scrap efficiently and economically using magnetic power. Permanent-magnetic chip and part conveyors handle many sizes of ferrous materials, including small parts, stampings, scraps or chips. Permanent magnets move inside of a liquid-tight submersible housing and attract, hold and convey the materials. A lack of any moving external parts prevents jams and helps minimize risk of operator injury. And, the material being handled slides along a stainless-steel slider bed, so, as with a vibratory conveyor, there is no belt to damage or jam. Metalformers can develop a variety of magnetic-conveyor configurations, in many sizes and widths, to be assembled from standard sections. This allows simple and economical installation of units to service hard-to-reach areas under presses, mills, cutoff saws or other machines. Standard conveyors are available as straight horizontal units or with an angled incline as great as 90 deg. Models also are available with large, sweeping radii to elevate long, difficult-to-handle scrap or parts. Advances in materials and the use of UHMW (ultra-high molecular weight) polyethylene track by some conveyor manufacturers have essentially eliminated maintenance issues related to conveyor tracks. With no external moving parts, magnetic chip and part conveyors typically require the least amount of maintenance of all conveyor types. Belt wear typically is less with magnetic conveyors than nonmagnetic, because parts remain stationary on the magnetic belt and have little chance of working their underneath the belt to cause wear. Magnetic-belt conveyors, similar in design to cloth- or rubber-belt conveyors with the addition of a permanent-magnetic rail mounted under the conveying surface of the belt, provide the flexibility of conveying parts vertically or even upside down. This flexibility proves critical where floor space is at a premium. Safety also is optimized—the constant, strong magnetic force prevents products in process from flying off of the line on ascents or descents. Damage to parts is reduced since the products can’t slide or change position. This eliminates pile-ups; it also prevents contact between items with sharp edges or with highly polished or painted surfaces. With a belt conveyor, the presence of a lubricant can cause parts or scrap to adhere to the belt, and also can cause the belt to slip on the pulleys. Additionally, material that sticks to the belt sometimes is brought back inside the conveyor housing and may trigger a jam. The use of dimpled surfaces and rough-top belts on belt conveyors can help deter material from sticking to the belt. Lubrication also can affect the performance of vibratory and magnetic conveying equipment. Lubricant tends to make parts stick to the pan or tray, causing a buildup. Lube also may build up in the tray and form a pool; parts or scrap become wet and sticky. Here, to deter material from sticking, screen decks or perforated conveyor trays allow coolants and lubricants to drain off. The thinner the material being conveyed, the more likely that lubricant will cause adhesion. Typically materials thicker than 11 gauge will not require screened or perforated slider surfaces. Designing belt-style conveyors, belt width typically is selected so that material does not overlap the belt. Hinged steel-belt conveyors can be designed with flights spaced to accommodate the size of the material to be handled. To properly specify vibratory and magnetic conveying equipment, the manufacturer must know the size and weight of the material that will be on the tray. Trays should be at least 50 percent wider than the longest dimension of the material being fed. Since your product, plant, equipment and personnel are unique, your material-handling system may have to be unique as well. When considering a new process or reconfiguration of an existing line, consider all of the conveying-equipment options, as well as overall costs, including not only the cost of the equipment but also related costs for setup, maintenance, etc.